“They’d be bankrupt, they’d be insolvent,” he said. 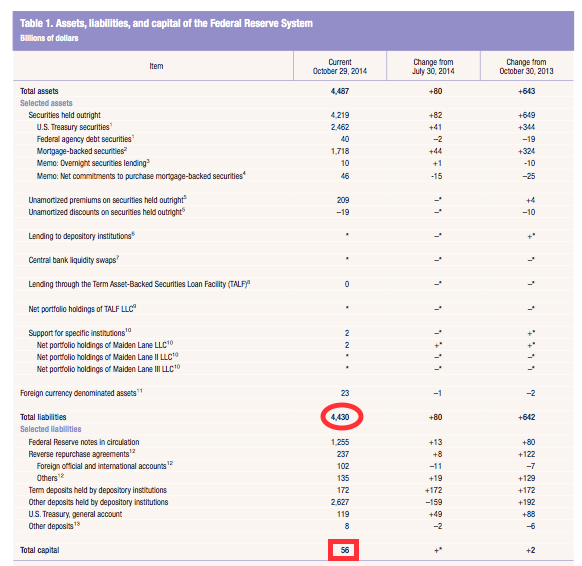 “[The Fed’s] liabilities are $4.5 trillion; their assets are $57 billion. Do the math. First: yes, he said “assets” when he meant “capital”. If that means the rest of his speech means nothing, I guess there is nothing to defend here (see also an argument about the definition of the word “investment” between a Finance type and an Economics type). What is Leverage in Finance? Let’s try to think here for a second – what is leverage? It’s a physics term which happens to apply almost perfectly to finance – the same way Archimedes was able to say about the lever “Give me a place to stand and with a lever I will move the whole world”, with enough financial leverage you could buy everything on the earth. Sure, I don’t know where you’d borrow the money (and I don’t know where Archimedes would set the fulcrum of his lever, let alone what it would be made of), but it’s true. Let’s say you buy a house for $1,000,000. You put down $200,000. Ignoring fees and incidentals, on the day you buy the house it is worth $1,000,000 and you have $200,000 in equity (not “assets“, as Paul misspoke – in this case, the “asset” is the house, and it is worth $1,000,000). Using our definition, we are levered 5:1… every move in the asset’s value moves your equity five times as much. If the house’s value goes up 20%, $200,000: your equity goes up 100%(! )… to $400,000. If the house’s value goes down 20%, $200,000: your equity goes down 100%(! )… to $0. So, Paul’s math was ‘right’, at least according to the numbers he quoted. For reference, here is the Federal Reserve’s last quarterly balance sheet. 4,430 / 56 = 79.107:1, not 80:1… so there’s that!!1!11! But The Fed Is Already Audited! Yes, it is, and before I get to the ‘but…’, let me say I don’t have a strong opinion either way on the auditing. When you play with international politics, you have to take certain steps you can’t take with a private company – I get it. (Okay now…) But… it’s audited in the same way as Mufasa described Simba’s future dominion over the Pridelands in The Lion King: “everything the light touches”. Well, Simba was curious about the dark spot – and hey, turns out that’s where the elephant graveyard was located and where the hyenas hung out! There was certainly something going on in that dark spot (not that we have to fear stampedes and regicide, but you get it, you’re smart). (4) a part of a discussion or communication among or between members of the Board and officers and employees of the Federal Reserve System related to clauses (1)–(3) of this subsection. There are legitimate arguments for why those two transaction exceptions exist, even though they obviously affect finances… that’s why they’re in the law. Just don’t make the argument that it’s fully, 100% audited – as an exception for world politics, it’s almost certainly defensible to leave certain things private, but it’s not “completely transparent and fully 100% audited”. But The Fed Is Making Payments to the Treasury! But the Fed Doesn’t Actually Have Liabilities Like We Do – the Fed Prints Money! Okay fine, I 100% agree with all of you who wrote that (and think that) – you’re absolutely right, and when we talk about the zero rate bound and the limits of monetary policy we literally talk about dropping printed money from helicopters. Maybe we’ll have “Helicopter Liabilities” on the balance sheet one day. Fine, Federal Reserve assets, liabilities, transactions, and policies don’t matter too much in the first degree (profits/losses/any other way you look at a regular company) – but in the second degree (inflation and deflation, affecting the rate paid on deposits, crowding out private investing, affecting stock market psychology, etc…) they undoubtedly matter. Now, look, we’re as pragmatic as anyone who knows how to pull up a chart on FRED – witness our posts on how inflation (and inflation expectations) is still low and there is no sign of rampant inflation anywhere, regardless of “money printing”. Of course, that doesn’t mean that these things are never going to be a concern again – “this time is different” thinking didn’t work in 2007, and it won’t work the next time, either. So, there you have it. Other than Rand Paul messing up “assets” and “capital” in his definition of leverage, it turns out everyone agrees in the end, anyway! Consensus reached, deadlock over! Seriously now, my thoughts on the Federal Reserve are mixed on this issue – I make exceptions for international politics, and I don’t think there is some massive conspiracy hidden on the books (but I’m sure there are some inconvenient entries. Certainly no hyenas, of course.). I’d probably lean at this point to keeping some exceptions to a full audit – or finding a way to plug any leaks which might damage the international order. I just thought these takes were a bit unfair – an Ophthalmologist got it basically right. I’ll try not to be too harsh when I see people confusing technical terms in the future! Well he did start with the claim they are bankrupt / insolvent. Which they aren’t. Leverage doesn’t equate to bankruptcy. Lehman went bankrupt when their debts exceeded their assets by over 100B or ~20%. Guess he plagiarized the wrong wikipedia page this time. The pull quote is pretty bad (I forget where I copied it from), but from what I can see it’s slightly out of context. He says something like “if the Federal Reserve were a small bank”. I looked for the speech but couldn’t find it, though. That quote is more understandable since I can’t really see a central bank going “out of business” short of a country failing with it or something.